Provide comfort for the family of Nancy Ludwig with a meaningful gesture of sympathy. Nancy Ludwig Schneller, mother, homemaker, wife, etc., led an exuberant life. Born in New York (Queens), NY, the daughter of Franklin Holcombe Loomis and Lora Anschutz Loomis. On December 31st, 2018 she set off on her next adventure ,four days after her 93rd birthday. She was well educated, graduating from The Hopkins School in New Haven, CT in 1942 and then Vassar College in Poughkeepsie, NY three years later. In 1946 Nancy walked down the aisle with George Otto Schneller III who preceded her in death in 1966. Their marriage began with a stepson, George,of Lawrenceville, New Jersey, then in quick order Nancy gave birth to six children – F. Gregory, Peter,of Alliance, Ohio, Nina, Richard,of Thomaston, Maine, Priscilla,of Alliance Ohio, and Lora,of Thomaston, Maine. In 1975, she married Edward Ludwig and was blessed with three more stepchildren, Laura,of Westin, MA, Rick,of Thomaston, ME, and Linda, of Hampden, MA. Her children have blessed her with 14 grandchildren and 14 great grandchildren. Nancy minded her children, grandchildren, and great grandchildren with a lovely combination of affection and astonishment. Nancy was predeceased by her first husband George Schneller, her second husband Edward Ludwig in 2018, along with her Son F. Gregory and a daughter Nina. Nancy was better than best at life’s chores. Her work life included a stint as the owner of an Alliance, OH business, The Crafty Ones where she also taught the arts of decoupage, crochet, knitting, et al. With her second husband, Ed, she managed the Rabbit Hill Inn in Lower Waterford, VT. She was no stranger to the communities in which she lived. Her service ‘work’ included stints as a Pink Lady at Alliance City Hospital, tutoring students for their GEDs at Alliance City Schools, distributing Meals on Wheels and offering home care and hospice help for Kno-Wal-Lin in Rockland, ME. 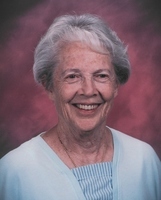 She was an avid reader and cherished her AAUW Book Club. Nancy’s laugh lines were profuse, her regrets few; she shared her love without hesitation, and her memories are treasured by many. Hers was a life well lived. Memorial donations in Nancy’s memory may be made to the Humane Society of Knox County, P.O. Box 1294, Rockland, ME. A Memorial Service will be held for Nancy on January 19th, 2019 at 2:00 P.M. at St. John the Baptist Episcopal Church on 200 Main Street, Thomaston, Maine 04861 with Rev. Peter Jenks officiating. Provide comfort for the family of Nancy L Ludwig (Loomis Schneller) by sending flowers. There are so many words I wish to say about My Grandmother Nancy that I struggle to pull them all into focus. I guess the two central ones would be acceptance and support. No matter what I wanted to do or direction I took she would always accept and support me without any feelings of judgement. Now don’t be confused: this is not to imply a cowboy world of no rules. I clearly remember the force of will she brought on grocery day when I ate the entire brick of Cabot Sharp White Cheddar which I cut in quarter inch strips and sprinkled with cinnamon sugar, or the time I ate so many green beans from the garden she could not make her dish for the night’s company. My grandmother could no doubt be firm, but would always return to acceptance and support. For me, our families, and the network of friends built over many years. Nancy was so many things to each of us, and in many cases the rock that brought us together. In her passing I wish all of us can be the rocks of acceptance and support to keep our friends and family together. Thank you with all my heart granny Nancy, for supporting me and accepting that precocious child, and helping forge the man I became. With deepest sadness and sympathy, hopefully sharing this memory helps a little: One of my favorite things about Nancy were her stories. Like the one about David watching a cat eat mouse in the garden and declare “Personally I prefer macaroni and cheese.” Or the one about dolphins being shaped like a wheel with fins all around because when you watch them swim across the ocean, that’s what they must look like when you take them out of the water. Or the one where spiderwebs covered in dew are really fairy laundry laid out to dry in the sun. Or the real reason she hated rhubarb. Her stories drew you in and made you feel welcome and trusted. They made you feel like you shared a magical secret. And Nancy loved to share them. Some of her best Christmas gifts were the books by Maine authors and illustrators she sent to Grace and Christopher each year. 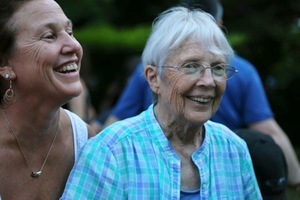 They were a connection with so many of the things she loved: Maine, writers, her family. And she wanted to hear your stories too. When we came to visit, she always asked “So how have you been?” or “What have you been doing?” and listened carefully to the answers, and wanted to see pictures of places we had been, or hear about people we had seen. 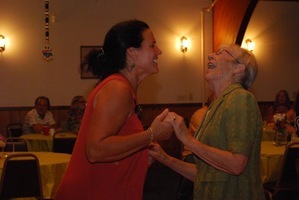 Nancy had so many stories from her life, from her family, events, travels, adventures, all of the experiences with people she knew and loved, the times she shared with her family over the years. 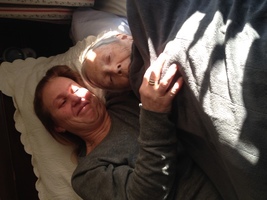 And sharing those stories with an open and loving heart created a sense that no matter where you might visit her, you were home and part of the family. I will miss that magic deeply. Thank you Nancy, for sharing your stories with me.